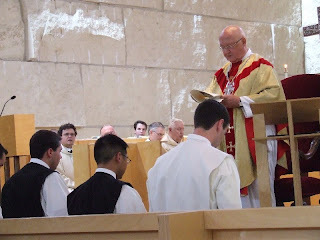 Yesterday, we were able to attend the profession of vows for some young men of the Cistercian Abbey. The professions are always held on the feast of St. Bernard of Clairvaux, the order's founder. It was a last minute decision we made to go, but I am so glad the kids got to see these young men taking this step towards fulfilling their religious vocations. It gives us great hope for the future of this very special order. I took some pictures, but they were from a very bad angle and done while trying to entertain a 4 year old during the 2 hour Mass. Yeah. Thank goodness for the cookies and fruit at the reception in the courtyard or I don't think he would have made it! This was a group of four young men. 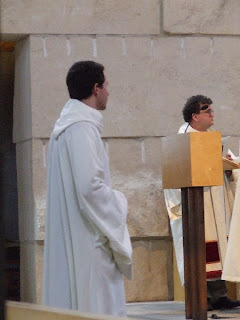 The two on the outside (one of them can't really be seen in this shot) were making their first profession of vows. They also exchanged their white cintures and scapulars for black ones. The two young men in the middle were renewing their vows. The one without the glasses is BigBoy's favorite brother! Br. Augustine can speak Spanish, hates hissing cockroaches, loves cherry pie and can really rock out on the piano! May God bring to completion the work he has begun in you. This young man, Br. 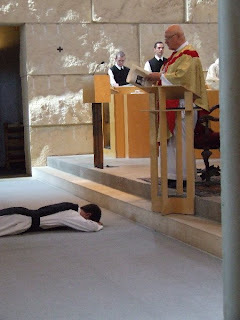 Joseph, was making his final profession of vows and will be ordained to the deaconate next month. The mercy of God and that of the Order. What do you ask of God's mercy? I ask for perseverance in God's service in this monastic community all the days of my life. May the Lord guard your coming and going from this time forth and for evermore. 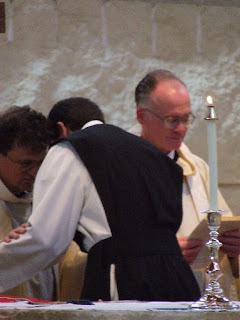 The newly professed approaches the Abbot, who clothes him with the white cuculla, the ancient symbol of the Order of Citeaux and the purity of its calling. May the Lord clothe you with the new man, created in the image of God, in the justice and holiness of Truth. May the ministry which is exhibited outwardly by us be accomplished inwardly by the gift of the Holy Spirit. Amen. God bless you Brother Joseph! I am so glad you posted about that. Their ceremonies are always so beautiful. I was wondering when Br. Joseph would make his final profession. My husband's brother make's his final profession in January, and I am disappointed that it in Italy so we won't be able to go. How beautiful. I miss the Cistercians and I miss going to mass at the abbey. Thank you for sharing this little taste. You should have seen how the older priests were just beaming at the reception after. Fr. Robert said they have never had 5 men making vows all at the same time. They have 11 men in the novitiate right now and if they are all ordained, the future of the order looks bright! Please pray for them! I just found your blog recently from a link at Faith & Family. I saw this post today and thought, "Oh, wow! She has Cistercians near her, too!" Then I saw the pictures and said, "Hey! Those are our Cistercians!" =) How neat! What beautiful pictures! Thanks for sharing! My sister mentioned they had a big novitiate right now. That's great news. Oh I would have loved to see all those beaming Cistercians! I will pray for them. Thanks for stopping by Mamapajama! I hope you will introduce yourself sometime so that we can say hello in real life. We almost went to the ceremony but got busy here at home. We are in the metroplex but still about 45 min from the Abbey. Thanks for sharing the pictures - they are beautful! My boys just the 'cool' young men!